As part of a provincial mandate to promptly and efficiently deliver a number of new school facilities across Manitoba, the 76,400 s.f. 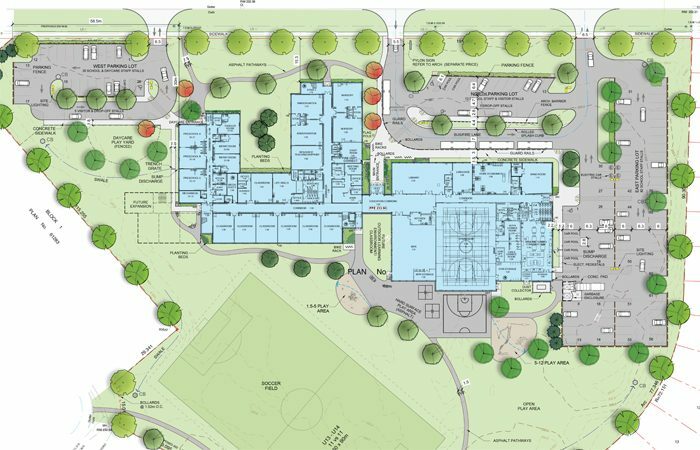 K-8 facility will provide new education, recreation and associated child care space to one of the fastest growing neighbourhoods in Winnipeg. Planned for an initial enrollment of 600, but designed to accommodate up to 800 students, the new school forms part of an overall redevelopment of a new neighbourhood located on Jefferson Avenue that will anchor a broader precinct community development in the area. Oriented primarily east to west, the linear building is organized into two distinct blocks that are connected by a large, two storey Student Commons space that forms the heart of the school and defines the main entrance to the school. The one storey east block contains the major public and specialized education spaces, including the gym, MPR and library, while the two storey west block is organized around a courtyard and contains the administration suite, main classroom spaces and the daycare. This “U” shaped two storey configuration creates four distinct education houses that locates the daycare children and early years students on the main floor and the middle years students on the second floor. Upon entering the building, the Commons opens up to the Outdoor Learning Classroom that was developed to raise awareness of indigenous culture and this theme continues into the Commons itself as well as other areas of the school. Working with the division’s Indigenous consultant and developed as a “Building as a Learning Tool” credit towards LEED silver certification, this indigeneity emphasis was an important priority for the school division in terms of raising awareness of the history, culture and contributions of First Nations people within what is largely a population of new or first generation Canadians.